Aalto KAL: Part 4, What Now? According to the calendar, the Aalto KAL is over. However, I don’t think anyone is finished with their poncho yet. Am I right? I know I’m not! I haven’t even finished with the first half!! 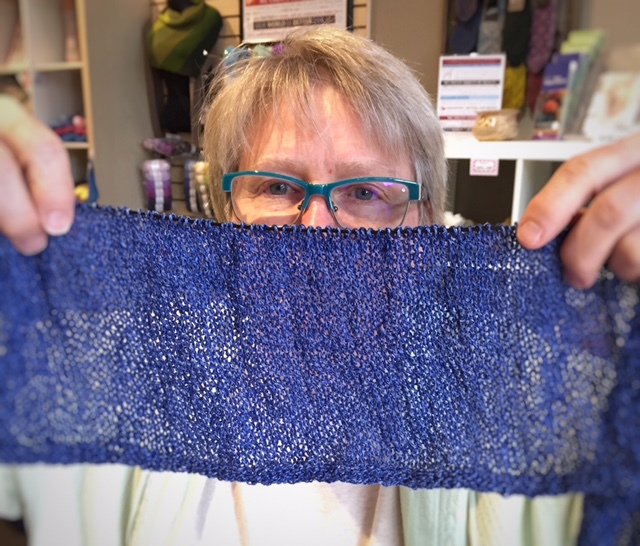 And Mary Lou who has been attending the in-person KAL hasn’t either. We took a pic yesterday of our progress. So, first of all, we are going to extend the knit-a-long. If you can or want to join us in the store, we will be meeting Saturdays, July 29 and August 12, from 2-4pm. That’s four more weeks. Not sure if that will be enough, but we will assess when we get there. I’m hoping to get to the shoulder shaping in the next few days, and I will do another post on the short rows then. What we noticed, though, when we took the photo is that my fabric (the orange) is much more open than Mary Lou’s fabric (the blue). It’s hard to tell in the above photo, but here’s a close up. We decided we had better check our gauges again. Oops! Neither of us is on gauge! I am back to 19 sts/4″ and Mary Lou is at 25 sts/4″! I am not terribly concerned about mine. I know I can stretch my finished piece vertically and gravity will do the rest. I may never achieve that perfect 22 sts/4″, but it will be close enough (remember my comment about being tall?). Mary Lou is also not going to worry about it. She is short and was concerned about the length of the poncho down her arms. That is not going to be an issue at all now. And, when she held up the piece to her body, it was obvious that the circumference will be big enough to accommodate her torso, so that’s not a concern. She can also stretch her poncho horizontally when she blocks it if she decides she needs more room in the torso. This is one of the beauties of this garment – you don’t have to be spot on with your gauge to still have a great poncho. But, because of the airy, open nature of this fabric, this method won’t work – it would show through as a line on the right side of the fabric. The join is in the middle of the row right under where Mary Lou’s nose ends. Can you see it? Neither can I. So, go ahead, change yarns in the middle of the row! Bonus tip: This type of join is also ideal when working with cotton yarns. My favored knitting in method is terrible for cottons – you can always see the join from the right side. Knitting several stitches with the old and new yarns held together, surprisingly, is not nearly as noticeable. For a tighter fabric, I may only do a few stitches , but for open fabrics, where the stitches are looser, I like to do 8-10 stitches. If you came to 3 Kittens during the Minnesota Yarn Shop Hop 2017, you probably picked up a copy of our Disco Ball Shawl pattern. Unfortunately, there just wasn’t enough room on the printed pattern to incorporate several useful tips, so we’ve put some extras in this post to help you finish your shawl successfully. This is a rough drawing of the shawl. The actual shawl’s hypotenuse (the longest edge) is actually curved as is the bottom edge. 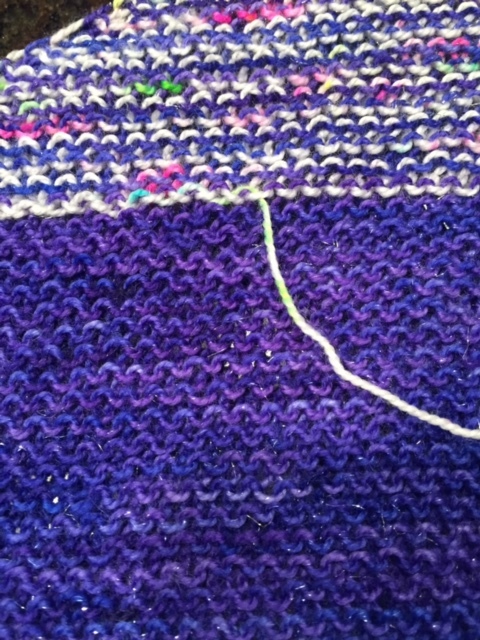 The following chart is a representation of how the color sequencing occurs in Section 1 of the shawl. Some people (like me!) are more visual and like charts and diagrams. This is for you! My test knitter didn’t know exactly what I meant by “st from the row below at the base of the bobble”, so we thought a series of pictures might help you! This is a large shawl. If you would like to shorten it, I suggest removing the last stripe sequence. I hope all of this helps you make the Disco Shawl!